From the 1780s onward the majority of the slaves brought to the Cape were known as Mazbiekers and even after the abolition of slavery in 1834 ‘Mazbiekers’ continued to then be brought to the Cape as indentured workers. ‘Mazbiekers’ were the slaves that came from a wide range of countries in East and Southern Central Africa to the slaver station in Mozambique and then on to the Cape of Good Hope where they large were put to work in the agriculture and public works sectors. Sante Lydia of District Six was the child of a ‘Mazbieker’ slave. The ‘Mazbiekers’ are an important part of our heritage in the Cape. They also made up the majority of the slaves that took part in the 1808 ‘Jij Rebellion’ of slaves that was brutally suppressed by the British Dragoon troops. – In 1910 Lydia ‘Ou Tamelytjie’ Williams, the Saint of District Six passed on at the age of 90. She was born into slavery, her father being a Mazbieker slave. The picture with her brief biography, appearing here, was a cameo part of an exhibition which I did more than a decade ago, called ‘THE TIES THAT BIND US’. Like my special Saint – San Martino de Porres, saint of the slaves and mullatos, Sante Lydia dedicated her life to promoting healing amongst freed slaves and their descendants, operating from her one room rented home on the St Philips Anglican mission estate. 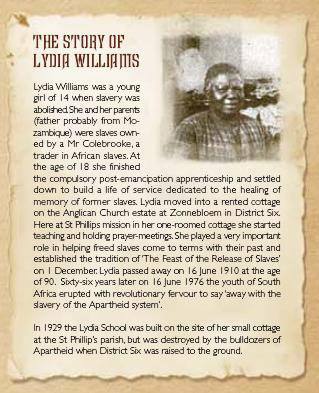 Lydia’s story is another of the many hidden stories of the people of Cape Town. She is another whose name and story ought to be memorialised. She was the unsung Nelson Mandela of her day.